Improve operational efficiency while improving patient confidence. Healthcare is changing at a rapid pace. The ability to effectively communicate with your employees, patients and visitors is crucial to running your facility. Digital signage is an opportunity to visually communicate utilizing content that is interactive, engaging and educational. 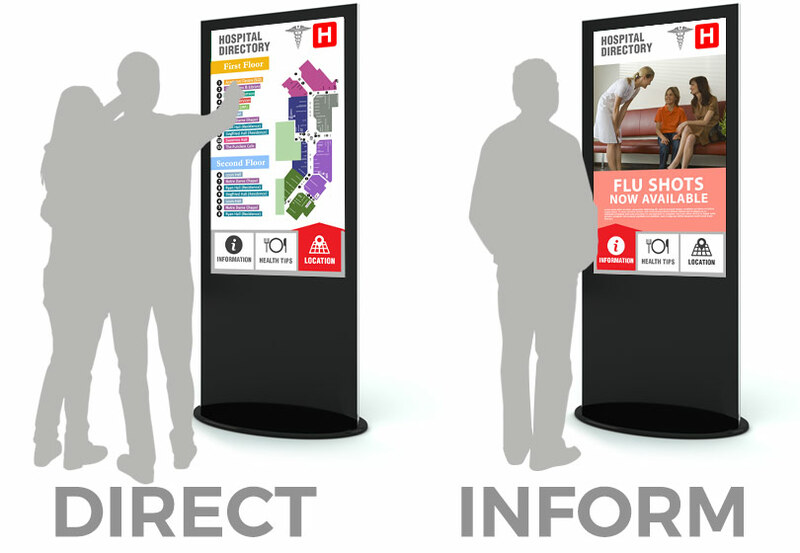 This is accomplished using a variety of visual communication mediums such as Video Walls to recognize donors, interactive kiosks to provide Wayfinding services, self-service kiosks to expedite check in, information screens in high traffic areas to communicate new services, as well as zoned cable television displays in waiting areas to reduce perceived wait times. Create a facility based emergency broadcast network to ensure a safe environment for all. Adding Digital Signage to waiting areas, hall ways, and common areas will engage your visitors with relevant real time information such as health tips, directions or facility information. Interactive Kiosks are a great way to welcome visitors with a modern look of the facility using a digital directory. 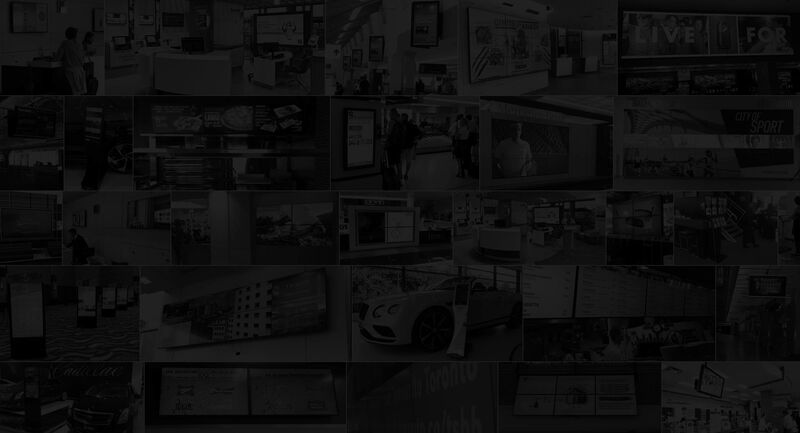 Digital Signage solutions is a most effective way to visualize content and convey your message to an audience. Dynamic visual communication is easy to consume and very user-friendly. 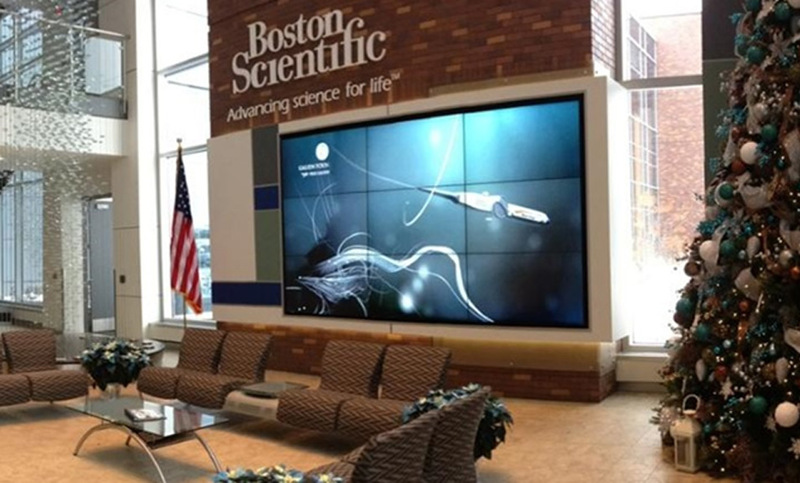 Video walls are a great way to instantly capture attention, build awareness and give your healthcare facility that modern look at feel. Our video wall screens, like all of our screens, are commercial grade with ultra narrow bezels to minimize the gap between each screen. Our purpose-built video wall players are specifically designed to power video walls with Ultra High Definition 4K resolution. 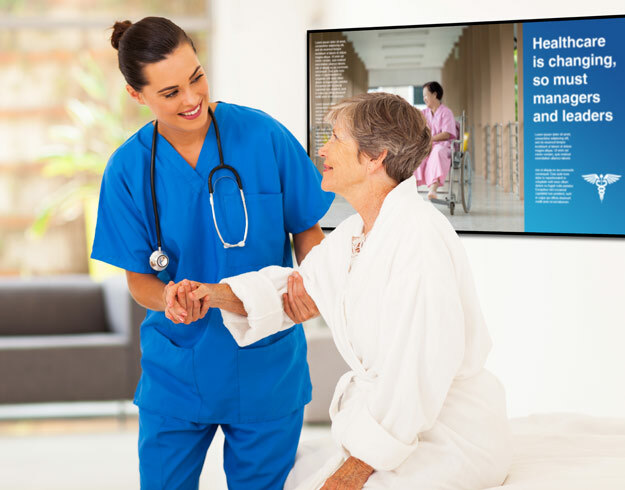 Reduce the perceived wait time of visitors and patients with engaging digital displays. Displaying health statistics, the latest wellness information or even showing RSS feeds will help the time pass quickly.